Lake Country Associates | Surrounded by Turkeys! 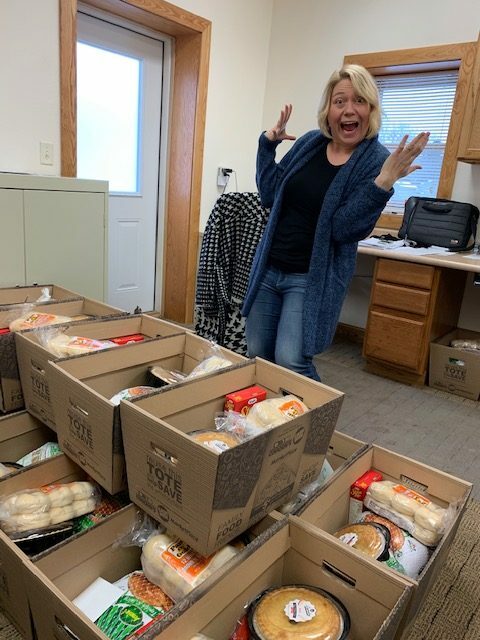 A big thank you to the members of the Lakes Area Vinyard Church in Park Rapids for their donation of 22 boxes filled with Thanksgiving meals for families in need. The Vinyard Church has been partnering with Lake Country Associates to distribute the boxes of meals to the people we serve for the past four years. Each box gives a family in need the opportunity to share a special meal with their loved ones. Connecting the people we serve with family, places of worship and community events is an important step in the path of recovery. Thank you to the members of the Vinyard Church for their generous donation to clients in the ARMHS program. Another opportunity for the Park Rapids community to gather for a Thanksgiving meal is the 36th Annual “Thank Meal” at the Riverside United Methodist Church North of Park Rapids on Highway 71. The meal is served Thanksgiving Day from 11:30 – 2:00. There is no charge for the meal. Free will offerings are appreciated and go to offset the cost of the meal and support local charities. For more information about the Thank Meal, call 218-237-TRKY.